Endometrial cancer occurs most often in women from the ages of 55 to 70 years old and is responsible for 6% of cancer cases in women. 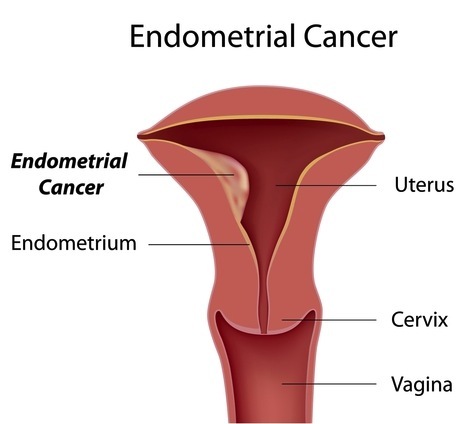 Endometrial cancer develops in the lining of the uterus, also called the endometrium. Endometrial cancer is the most common form of uterine cancer. While the majority of cases of endometrial cancer occur in older women from 60 to 70 years old, there are a few diagnosed cases before the age of 40. Endometrial cancer is caused by a growth of abnormal cells in the uterine lining. Endometrial cancer may also be referred to as uterine cancer. The good news is that this type of cancer can normally be cured when it is detected early. In most cases, endometrial cancer is detected in the early stages before it has spread beyond the uterus. The main cause of endometrial cancer is unknown, but it is believed to be related to levels of estrogen in the body. Estrogen stimulates the buildup of the uterine lining; research has shown that high estrogen levels in animals can cause excessive growth of the uterine lining to result in cancer. Endometrial cancer is thought to be caused by having an imbalance of estrogen compared to progesterone in the body. This type of hormone imbalance will cause thickening of the uterine lining, which will build up and cause potential cancerous cell growth. Other health conditions have been associated with endometrial cancer, like colon cancer, breast cancer, gallbladder disease, polycystic ovarian syndrome, and high blood pressure. Since endometrial cancer can often be caused by an abnormal overgrowth of the uterine lining, also called endometrial hyperplasia, a doctor may recommend a hysterectomy to prevent this condition from developing into cancer. Although hyperplasia is not cancer, it can often develop into endometrial cancer. Hyperplasia most commonly occurs in women after the age of 40. Women who are obese also have a greater risk of developing endometrial cancer. This risk continues to increase if a woman has never had children, had an early first menstrual period before age 12, or went through menopause after age 55. A doctor may also examine a woman’s family health history to determine if she has a mother, sister, or daughter who has been diagnosed with uterine cancer. Women with a family history of endometrial cancer have an increased risk of developing the illness. This risk is also increased if a woman has a family history of genetic colorectal cancer, otherwise called Lynch syndrome. Keep in mind that women who develop endometrial cancer may not have any of the above risk factors, and women with the risk factors above are not guaranteed to develop uterine cancer. Source: "Definition of Endometrial cancer." www.medterms.com. N.p., n.d. Web. 10 Oct. 2011.